Soc Mammy: The things I bought, and shopped for, in hope. A few months ago, I was full of joy and hope. I thought about all the things I had in the attic that I could use again, the teeny tiny little vests and babygrows. However, there were things that I planned to do differently, this time around. I didn't start using cloth nappies till E was about 10 months old, as I allowed myself to be talked out of it (funnily enough, by people who had decided themselves not to do it - everyone I spoke to who actually used cloth nappies for any length of time was very encouraging). So I had all bigger ones. No teeny tiny little cute cloth for a new baby bum. I was determined that this baby would have a cute cloth nappy on for her or his first. So I went shopping. I bought a few different types, some tots bots, some lollipop, some little lamb. 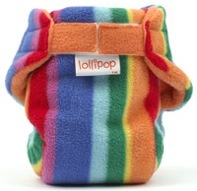 But top of my list for the first nappy he or she would wear was a lollipop rainbow pocket. I mean, isn't that just the cutest little nappy ever? I bought two of them. Gorgeous. They are now in a box in the attic. I hope they do grace a baby's soft newborn bum, someday. I also didn't sling E properly until around 10 months (was it then I discovered my inner hippy, or what?!). I had a shop-bought sling which only lasted a short while, you can read more about our babywearing journey here. So I was determined that I would carry the new baby in a sling right from the start. Both for the closeness, and for the ease of having to entertain an energetic toddler and care for a teeny baby at the same time - anyone I know in that situation swears by being able to carry the tiny one, hands-free. I looked into it, and decided I wanted to save up for two slings in particular - a stretchy wrap and a ring sling. Specifically, the Storchenweige Inka ring sling, above, and the JPMBB stretchy wrap, below. I imagined myself holding my little one close, in a sling-womb. Snuggly. Perhaps even mastering feeding while in the sling. I imagined, and looked to the future, and hoped for all these things. Oddly enough, I think, to other babywearing converts, the other thing I decided I wanted this time was a proper travel system. We were given a pushchair, and a pram, and a car seat. But they were given by different people. The pram has good sturdy frame and wheels and is perfect for walking on the country roads around here. The pushchair is light and easy for town. The car seat...well, let's just say I was never too fond of it anyway. So I was going to indulge, this time, in a car seat that both clips into a base rather than has to be strapped in with the seatbelt each time, and one that will fit the Graco Mirage pushchair we have. I looked around, and decided that the January sales would be a good time to buy and get a discount. After all, the little one was due at the start of May, so that would give us plenty of time. Sorry for the morose nature of the post. I am trying to purge the feelings through writing, I think. The January sales, something so silly and random like that, was my trigger today for these thoughts. Because I had decided to wait for them for the car seat, and now they're here, and I am reminded. oh Jo! :-( a big hug from me.